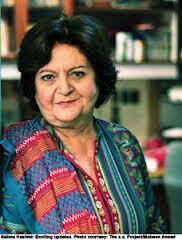 “The defeated forces are once again ore out to mar. The trial process when Bangladesh is making remarkable advancement and the long standing process of the trial of war crimes is at the juncture of desired culmination”. India is facing difficulties in the northern states where freedom movements are going from last half century. These states known as, “Seven Sister States” are Arunachal Pradesh, Assam, Manipur, Nagaland, Tripura, Meghalaya and Mizoram which are practically in the control of freedom fighters. In order to tackle this situation in spite of political measures New Delhi has handed these states to Indian Terrorists i.e. Indian Army just like Indian Held Kashmir. 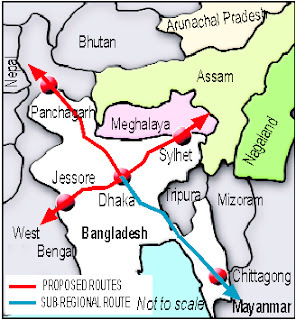 The major problem for India is the land connection/way to these states that passes through from a narrow valley/pass between Bangladesh and Nepal named as Gawahatti. Moreover, in order to crush freedom fighters India needs utilize land passage from Bangladesh so that the resources of these states could be used rapidly. 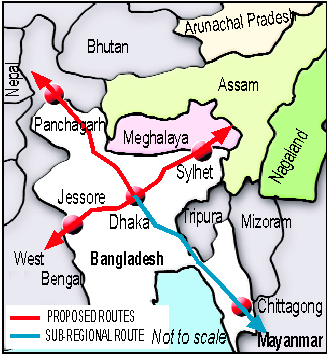 Since 1958 India had been begging to Pakistan that it should be allowed at least to utilize road from Western Bengal to Agartala, built by the English while Pakistan had only one demand that it should resolve Kashmir dispute first for which India is not ready at all. This road was the biggest reason behind the Indian conspiracy against Pakistan in 1971. However, in spite of separation of Bangladesh it was not possible for Mujeeb to allow India to utilize the road because of the hatred among Bangladeshi people against India that had not subsided even after the separation of Bangladesh. Meaning that the statement given by Indira Gandhi, “we have drowned Two Nations Theory in the Bay of Bengal” was nothing more than day dreaming, because after murder of Mujeeb it became impossible for the succeeding govts to provide land access to India. But after American invasion in Afghanistan it became inevitable for USA to bring Haseena Wajid in power in Bangladesh at the wish of India and the end of Islamists/Muslims in Bangladesh a need for India because Two Nations Theory had become a nightmare for Indians. After coming into power on the one hand Haseena Wajid took steps to make Bangladesh a secular state as the Indian wish and on the other hand signed the memorandum to provide access to Indians to Northern States however this was given the form of a proper agreement in 2012 when opposition and religious parties are busy protesting against the punishments and death venalities awarded to many elder Islamic scholars and leaders of Jamaat Islami and Bangladesh National Party like Professor Ghulam Azam, Mutee ur Rehman Nizami, Salahuddin and Abdul Aleem. In the agreement signed by Haseena Wajid India has not only been allowed to utilize Bangladeshi land for Northern States but for trade with Burma (Myanmar) as well. Moreover, Bangladesh has a long standing dispute with India that is suppressed during the reign of Awami League but any patriot party having love for country and public could not ignore it. If we look at the map of the Bangladesh it is surrounded by India from three sides, its boundary length is 4095 Km out of which 2979 Km is land and 1116 Km is river. According to the survey of rivers there are approximately 300 rivers and streams that enter into Bangladesh from India out of which 54 are those whose water flows whole year. While Barhamputr, Jamna and Hagli are those rivers which are considered among the greatest rivers of the world. But due to the construction of dams and barrages over these water resources their flow has been reduced to more than half but no reaction/protest has been observed from Bangladeshi side while India is working on construction of more dams and change the route of the rivers towards its grand water reserves. This might be astonish one that during the reign of Khalida Zia Bangladesh and India were on the verge of war due to these disputed water projects of India, international powers intervened to stop the war. These are the Indian interests attached to Bangladesh which are being protected and procured fully by Haseena Wajid and now as the elections are ahead so the incidents of 1971 are being propagated, Islamists, those who hate India and support Two Nations Theory are being termed as traitors, supporter and agents of Pakistan in order to create such an environment that create favorable situation for Haseena Wajid and her political party and the distribution of awards was also a part of this propaganda which was reinforced by few traitors of Pakistan Ideology by accepting the invitation of Haseena Wajid.